Write a Blog about watch batteries said Gary who designed and manages my website. I had no idea what could I possibly find to write about watch batteries but I’ll give it a go. When we first started stocking and fitting watch batteries I was not really that keen. There are so many different batteries and what ones should we stock. Our supplier was very helpful with this and told us what the most popular ones were that they sold. Ten years on and we stock 24 different types of button batteries that are used in watches as well as other items such as children’s toys, kitchen and bathroom scales, computers, calculators, blood glucose meters, clocks and car remote fobs just to name a few. We find that 3 of the most popular button batteries we use are AG1, AG4 and CR2032. Different manufacturers use different reference numbers to identify the batteries they make. For example the AG4 watch battery which is very popular it is also known as SR626SW and 377. Here is a list of the batteries we stock and some of their other reference numbers. 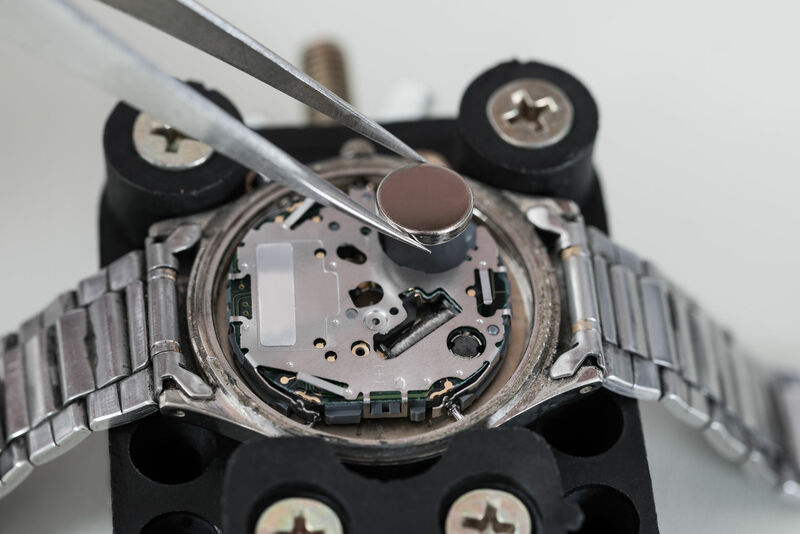 Identifying certain button batteries can be very challenging, but what is more challenging is when a customer brings their watch in and there is no battery inside, sometimes it is not possible to find a battery in this situation. Removing and putting the back of a watch is not always as easy as you would expect. Fortunately we have a selection of tools to help us do this job including tools for screw on backs and a case press. We also have the tools to remove links from some but not all watch straps and stock a small selection of pins for watch straps. Whilst we do not stock new metal watch straps we do sell leather straps in a selection of sizes and colours.